Poor England! You just can't catch a break. Back in the day, it was quite common for Scooter singles to get a separate release for remixes. 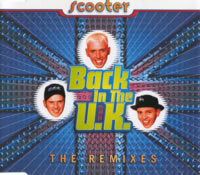 Such practice was common up until around 1997; so when Scooter found themselves another hit single with 1995's "Back In The U.K.", it was automatic that a remix disc would follow in January 1996. Let's take a look at those fine, fine remixes. Starting off the train of funk is the Tom Wilson Remix, which is even more synth-laden than the original, giving it a bit of added depth. As well, the main melody, originally taken from the British series "Miss Marple", is here in full effect, though the bassline adds a few unique tones of its own. It's actually not far off from the original in terms of variety, but the altered instrumentation really does make it sound like a tune of its own. If you're looking for something completely different, however, then why not check out Back In Villabajo, a strange version featuring Spanish guitars, Spanish shouts, and corny MIDI-style synths plucking along before eventually getting to the melody we've all been waiting for. Acid synths also make an appearance later on. All in all, it's a hodge-podge of unusual elements, acting more as a curiosity than anything destined for the clubs. Next up is Double M's Bassss Mix, courtesy of (obviously) Double M, a.k.a. Matthias Menck, formerly of Brooklyn Bounce. It's pretty wild, although the lyrical focus is on H.P. saying the word "bass". The first three minutes are a thumping bass and various odd percussions to build up to (eventually) the main melody makes a triumphant return with a strange but tolerable rolling synth. The song doesn't quite have as much bass as the remix title suggests, but there's still enough to shake a few speakers. Back In Kellys Mix (Paddy Frazer Mix), unusually titled, starts out sounding somewhat like the original before moving into straightforward bass-and-beat territory. It ultimately pretends to be a track to be played at a stadium, complete with crowd cheers and the pounding of the bass, typical of arena-style music. Mildly decent, but not spectacular. We end the slew of remixes with Double M's Bassss Dub Mix; why this is even in existence, I have no idea. It's the bass part of the original mix, but without any melody at all. Waste of over seven minutes of my life that I'll never get back.